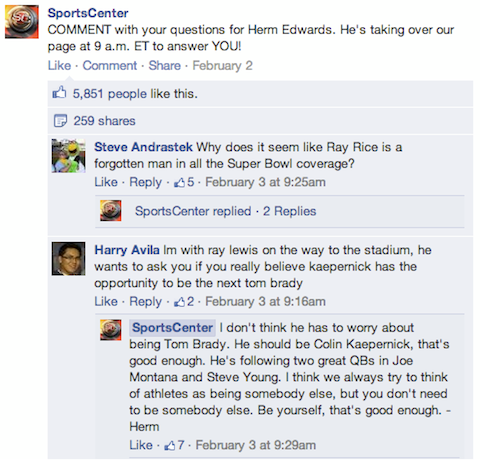 Replies and threaded comments improve the quality of conversations on Pages. Facebook Updates Policy for Cover Photos on Pages: Some of the old restrictions (no calls to action, no websites or addresses) have been removed. 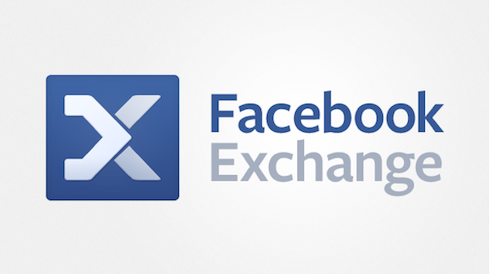 You can now tell visitors to like your Page right in the cover photo. Note that Facebook’s Cover Photo terms state that the cover photo cannot include more than 20% text. 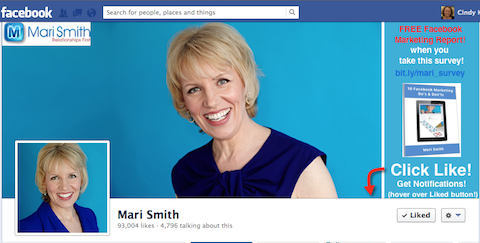 Notice the call to action on Mari Smith's Facebook Page. What are the best resources for building my Facebook Page? Whom do you want to meet at Social Media Marketing World? Share your best blog post this week! LinkedIn Search Gets Smarter: LinkedIn has “unified the search experience so you no longer need to search for people, companies or jobs separately.” New features include auto-complete, suggested searches, smarter query intent algorithm, enhanced advanced search and automated alerts. "In about 30 minutes, you can follow the step-by-step wizard to upload data from AdWords and your mobile website, and make some key assumptions to create your Full Value of Mobile estimate." Facebook Adds Unpublished Posts Option for Advertisers: Facebook users can now promote unpublished posts, which are posts that are not published on the Page’s timeline. You have more options when promoting posts on Facebook. 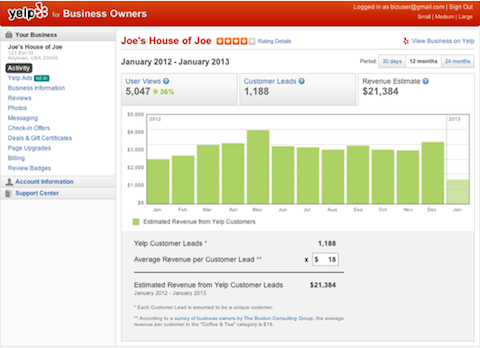 Yelp Launches Revenue Estimation Tool for Local Businesses: “This new free tool does the math by multiplying customer leads sent from Yelp each month by the business’s average revenue per customer lead.” The information also includes the average spend per customer for each business category for reference, based on a recent Boston Consulting Group study. 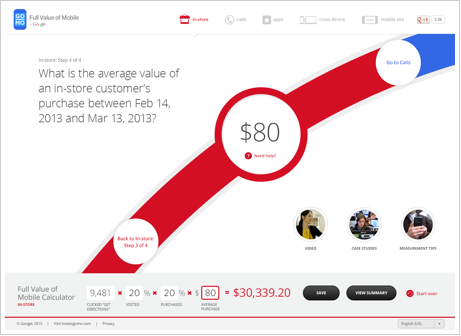 "Every local business owner can use our new Revenue Estimate tool to judge how her business from Yelp compares to the national averages from the survey." Google+ Launches New Versions of Google+ for iPhone and Android: This latest update allows iPhone users to do basic edits like rotate and crop, as well as select filters and more. 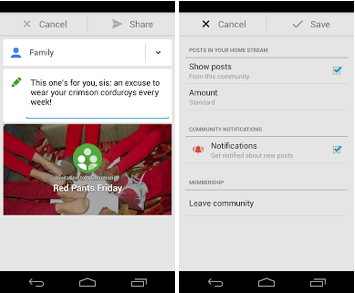 The Google+ app updates also have new features for managing your Google+ communities, including the ability to adjust the volume of community posts in your Home stream. 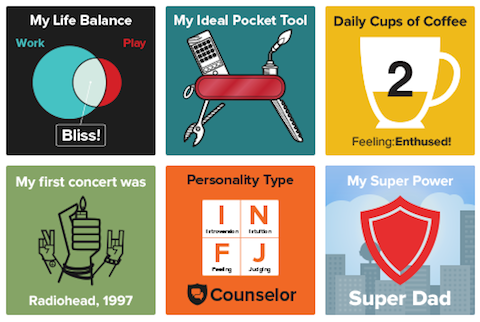 Vizcards "showcase your achievements, interests and quirks, both professionally and personally." Flipboard Gets A Major Upgrade: Flipboard 2.0 is a major new edition to this popular curation app. You can now also collect and save articles, photos, audio and video by organizing them into beautiful magazines. With this new feature, "advertisers can run Page post link ads on the right-hand side of Facebook and in the news feed on desktops." Icann Launches Trademark Clearing House: Brands can now pay to register their marks ahead of the new .brands top-level domain names (TLDs). Watch this video to get a quick overview of Social Media Marketing World.